World Cup Champion Bode Miller honed his skills on Maine’s slopes at Sugarloaf Carrabassett Valley Academy. Seth Wescott’s Gold Medal snowboarding training grounds are at the Loaf too. Although Maine’s big mountains offer plenty of challenge for the fastest alpine skier in the world, you don’t have to ski like Bode to experience the best ski trails in Maine. All levels of skiers can take to the peaks for a peek at the beautiful Pine Tree State. The most glorious vantage points are on mountaintops, and the most enchanting season to enjoy them is winter, when they sparkle in white under crisp clear blue skies. Maine’s alpine areas provide a kind of bird’s eye view (with boards on your feet instead of wings on your back). Whether it is a view of Moosehead Lake, the vast Maine forests or the mass of Mount Washington in the distance, it’s all included in the ticket price. Here are a few tame trails in Maine’s snow country that are picture perfect. You can admire the view along your way down, without worry of any daunting drop offs or man-size moguls. 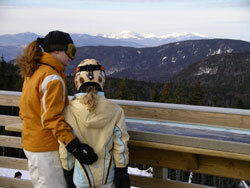 Shawnee Peak, in Bridgton, is a primo ski hill for families and shutterbugs alike. The fact that this was once called Pleasant Mountain Ski Area gives you an inkling of the gentle tone and trails. The Jack Spratt Trail, located under the summit triple chair, provides a pleasant cruise with amazing views of Maine’s Mahoosuc Range and New Hampshire’s majestic White Mountains. And with Moose Pond below serving as a frozen reflective pool to the ski area, you might feel like you are in Lake Tahoe – sort of. Sunday River’s best is Jordan Bowl – the furthest west of the eight- interconnected mountain peaks at this sprawling Maine resort. Be ready for an eye-opening view as the quad chair crests the last knoll. It’s a stunning but swift scene, as this high-speed lift zooms along and you must “prepare to unload.” After you slide safely off the chair, you can click out of your skis and climb a dozen stairs to the observation deck to properly admire the Presidential and Mahoosuc ranges – identified on the posted chart. The cruise down Lollapalooza, a wide undulating beginners’ boulevard that eventually escorts you to the Jordan Grand slopeside hotel where you can slide into lunch at Sliders, or back to the chairlift to repeat the experience. Sunday Punch at Sunday River is one of my personal favorites. This classic run was part of the original ski area long before Jordan Bowl was developed. After disembarking from the long, laid-back ride on the Locke Mountain triple chair, steer straight ahead and to your right. 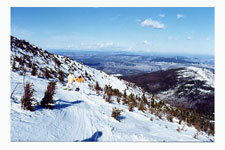 You’ll be instantly rewarded with remarkable views off the backside, to Shawnee Peak and Mt. Abram. You can also glimpse across several peaks that comprise the River Empire, which encompasses several miles. Just down the road from The River is Mt. Abram, a treasure for young families and frugal skiers. Mt. Abram has a few dozen fun runs with a playful Bullwinkle theme. One of the most scenic is Dudley Do Right, a trail for all levels with great views of the White Mountains and the Presidentials, and the longest trail. 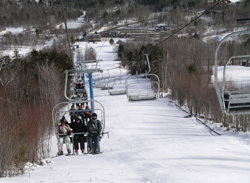 Upper Easy Rider at Mount Abram is another peak pick, with western views of the Presidential Range and a glimpse of neighboring Sunday River as you work your way down from the scenic summit of this 1,000-foot vertical ski area. 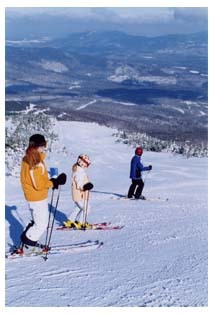 Saddleback in the Rangeley Lakes Region has the highest base elevation of any ski area in New England. Saddleback is proof of the theory “the higher you go – the better the views.” Tri-Color offers spectacular views of Rangeley Lake and the surrounding northwestern mountains – but you have to ride the tremulous upper mountain T-Bar to get there. Lookout at Camden Snow Bowl is “where the mountains meet the sea.” Where else in the world can you view the Atlantic Ocean from a ski trail? This friendly community-operated area in Camden offers a glance out to sea, so it is worth schussing for that alone. The fact that the Snow Bowl is very affordable and located in such a charming seaside town are added bonuses. Last but not least, Sugarloaf is Maine’s mightiest single ski mountain with epic, 360-degree views, spanning Katahdin to Mount Washington.It takes at least two chairlift rides to reach the 4,237-foot summit and the “top of everyone’s list” trail – Timberline. You can pause for a break inside the old gondola building (don’t get excited about anything but the view, there are no services – just a rustic ski patrol hang out). Timberline is your reward, a tremendously long, leisurely run with sweeping turns like an Omni Max presentation – giving the skier an ever-changing panorama. Timberline is justly marked with a “Kodak photo spot” icon on the trail map and an “easiest way down” Green Circle to encourage folks of all abilities to make the trek to the top. Another recommendation is a break at the cozy Bullwinkle’s mid-mountain lodge for a steaming hot cocoa and a chewy chocolate brownie. For the more adventuresome, Sugaroaf’s snowfields are hallowed ground with heavenly views and holy guacamole! terrain. From this northern vantage point, you just might believe you can see forever. Particularly outstanding are the views of the Bigelow Range, the mountains that provided the original inspiration for Amos Winter – Sugarloaf’s founding father. The White Nitro trail is a blast (if you will pardon the pun), beginning its drop from these summit snowfields. I should also mention that White Nitro is so blasted steep, it will take your breath away; just tell your carving companions that you are admiring the view when they ask why you’ve stopped. 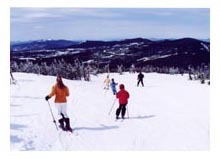 Maine has over 500 ski trails, each with a unique and ever changing view. Get out and ski Maine’s high points this winter.